Last summer I purchased the largest TV we’ve had in our house; a 55-inch LCD. In addition, it also supported 4K HDR. Over the course of a few weeks we eventually picked up a couple of 4K movies including Planet Earth 2 and I already had some games that could take advantage of the TV’s high quality. I splurged on this TV and spent $600. Granted, one could easily spend much more but for us it was a stretch. We were able to enjoy the TV for several months, until one day in late November or early December. On this day our toddler became angry about something that was probably very insignificant in the grand scheme of things (at the time he was almost two and a half so, as with most toddlers his age, anything could upset him). I don’t recall what it was though he probably wanted to go outside to the playground. If that was the case then I wouldn’t have let him because it was dark outside or because we were preparing to eat. He didn’t mind using the word “no” but he did not like to have it said to him. I turned around and went back to the kitchen where I was preparing some food and putting up dishes. I just happen to be looking his way when I saw him angrily pickup a Christmas decoration from our coffee table. It was a wooden, triangular Christmas tree-shaped piece. He threw it at the TV. Hard. In additional to a new Blu-ray player, last weekend I also purchased a Philips Sound Bar (CSS2123) for our living room HDTV. The speakers included with the 32″ HDTV are OK. They’re not the worst. The ones in my smaller HDTVs are so bad they must be connected to external speakers to be tolerable. Still, we like to watch movies in the living room. I didn’t want to deal with full-surround sound. That would require a heavier investment of money and space. 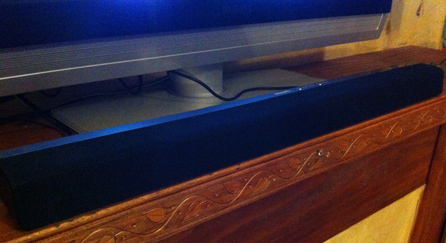 Instead, I decided to add a relatively inexpensive sound bar. Audiophiles may not care for this set but we both have enjoyed it. Music, movies, and television sound really good though movies that I have ripped from DVD to an Apple TV format do not (This was done using Handbrake. I’m not sure why – the quality may have not been good before but it’s only become apparent with the use of better speakers – my next test is to rip to a slightly different format or to try movies purchased through iTunes). The set cost $99 at Wal-Mart. It includes the sound bar itself, a wired sub-woofer, and a remote. During the first movie that we watched I had to turn the sub-woofer down. It was actually much deeper than I was expecting and I didn’t want to annoy any of our neighbors. I haven’t experienced any major problems though when I tried to use a coaxial digital connection only the sound effects from the Apple TV came through. None of the audio for Netflix, or from our Tivo, worked. I suspect this has more to do with the different audio formats (stereo versus true surround) and for now I only have it connected to the TV via the headphone jack, which is split out to RCA adapters that go into the sound bar inputs (stereo only). Updated 05/22/2013: So far so good. We haven’t had any problems with the sound bar. Warning: Based on information provided in several posts, and from talking to friends, it is very possible that you could severely electrocute yourself if you don’t know what you’re doing or if you touch the wrong part of the electronics. If you’re not sure it’s safe to do this then simply don’t. When I replaced the board I was very careful not to touch any components, including the underside of the board I was replacing. Of course, the unit must be unplugged before proceeding and it may be a good idea to let it sit for a couple of days before opening it. A couple of weeks ago we experienced a power surge from a nearby lightning strike that damaged one HVAC unit along with a few electronics. 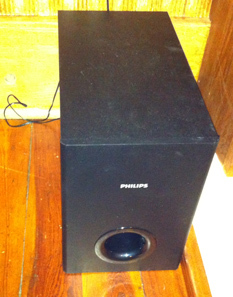 One of the items that was damaged was our older 32″ Philips LCD TV. This was largely my fault. I used to have a surge protector on that TV but the last one quit working and I forgot to replace it. When we tried to turn the TV back on it wouldn’t work and I noticed that a red LED, near the power LED, flashed 6 times, stopped, and then flashed the same sequence. Note: Most of this information is probably only applicable to households with a Philips TV and DVD player. Tonight I ran into an unexpected problem. While trying to watch a DVD in our bedroom the TV input was changed from HDMI2 (where the living room sources are connected) to HDMI1 (where nothing is connected). It happened any time I tried to pause or play the movie. In fact, it seemed to happen every time I pressed any button on the remote. I quickly eliminated the possibility of the DVD remote sending signals to the TV by preventing the IR from reaching the TV. The problem still occurred. After a moment I remembered another problem we previously encountered in which the DVD player was turning the TV back on a moment after the TV was turned off. I neglect to post about the issue but long story short the EasyLink capability built into both Philips devices caused the TV to turn back on if the DVD player was still on (or was in the process of shutting down). The solution was to turn the DVD player off before powering off the TV (since then I’ve also shut off the available EasyLink options in the DVD player). Tonight’s problem seems to be related. I disabled the DVD players EasyLink functions. However, even though the TV appears to have EasyLink support the setup menu does not include any options to disable it. I noticed that when the TV source is changed by the DVD player it always reverts to HDMI1. Before I purchased the matrix switch we only used the DVD player in the bedroom, where it was connected on HDMI1. At that point I realized the DVD player’s behavior hadn’t actually changed. We hadn’t noticed it before because it was already on HDMI1 and tonight was the first time we had tried to play a DVD since adding the switch. It’s not a true fix, but the workaround was simply to move the incoming living room HDMI connection from HDMI2 over to HDMI1 on the bedroom TV. Now the DVD player appears to operate as expected without changing the TV source. A while back I purchased a 4X2 True Matrix HDMI 1.3a Powered Switch w/ Remote (Rev. 3.0) from Monoprice.com and it’s proven to be a good investment. This switch has four inputs and two outputs. One of the features I’ve enjoyed is the ability to mix and match the inputs and outputs in any way. For example, I can have the same source go to both TVs or any one of the sources go to different TVs at the same time. The switch has only three buttons on the front. A power button and then two output selectors. Each button press of an output selector (A or B) alternates between one of the four inputs. It also comes with a very easy to use IR remote for changing the input/output combination. Since we use an IR repeater to control multiple devices from two rooms I went ahead and purchased a spare remote from Monoprice. In general, the HDMI switch is a solid product but it’s not without its hiccups. There have been a few times when I had to reset the HDMI switch, but so far those events have been very rare, especially when compared to my first, single output HDMI switch. The rare problem I ran into was a very distorted display and perhaps once or twice I wasn’t able to receive audio until I reset the switch. Of the few times I’ve had issues I think I only had to physically unplug the power from the device just one time. Hopefully, problems will remain few. Before I bought this switch I had an issue with my Philips 32″ LCD HDTV, typically when used with the PS3. It had a tendency to drop the HDCP signal, which is a problem with an DRM content such as video-on-demand. For a while I put an unused 2×1 HDMI splitter in line to boost the signal and that worked. Since I put the new 4×2 in line I haven’t had to use the other switch – it also seems to do a good job of boosting the signal. Overall, I’m very satisfied with the switch, especially when considering that the cost is lower than many other high-end HDMI switches that provide these capabilities. Updated 08/28/2011: In June of 2011 one of the output ports on the switch died. I purchased a 4×1 switch for temporary use but that didn’t work out. Instead, I went ahead and bought another 4×2 switch (same model). Last week I mailed the defective switch back to Monoprice for replacement. Last night my wife called me into the living room. She had been trying to watch something on the Tivo but at one point the television screen began alternating between black and green. She tried turning off the TV and then turning it back on but each time it powered up it was flashing. I powered off the Tivo. At first, it seemed to work. The Tivo startup screen displayed. But I guess when it switched over to a different part of the startup sequence the TV went back to alternating between all black and all green. I tried switching to different inputs on the HDMI switch and even powered off the unit and unplugged it, but still the TV flashed. Finally, I went for the more elegant trouble-shooting solution and did what I should have tried first. I unplugged the television from the power outlet. When I turned the TV back on it was working fine. I’m hoping this was just some odd fluke in the HDMI port and not an early sign of a soon-to-fail TV. Yep. It’s possible. It’s not as good as using an HDTV with HDMI input but it will work if your LCD monitor has a DVI connection. I came across this on accident when I needed to connect my work laptop to an external display (but I forgot my DVI adapter). All you need is a DVI to HDMI cable. Monoprice has some great prices. Just connect the HDMI end of the cable to your console and then connect the DVI end to the monitor. I never tried this in the past because I had always assumed there were electronics involved that would only support the connection one-way. However, it appears that HDMI truly is nothing more than DVI with audio and a different connector. I don’t have a true widescreen monitor so I don’t know if it will work better on one. My screen is between a standard widescreen and a standard fullscreen display, oddly. When I’m playing on the Xbox 360 I see the typical black bars above and below the screen that you would expect. However, there is some minor distortion – everything is slightly narrower than normal. It’s actually not very obvious and is easy to get used to. I haven’t experienced any artifacts, the smell of burning plastic, etc. So far, it’s worked great. There is one problem, though. I don’t know if it’s specific to older monitors or something that can’t be transmitted over DVI but the Xbox 360 does not receive the digital rights management information that it expects (yes, DRM here to ruin the fun once again). This means that Netflix streaming and probably any other video rentals or purchases will not work. I haven’t tried this with my PS3 but I would be surprised to learn that it does not work the same way.